Just minutes from Massachusetts General Hospital, The Liberty, a Marriott Luxury Collection Hotel, Boston is in West End and within a 15-minute walk of Museum of Science. This luxury hotel is also within a short walk of The Freedom Trail and Boston Common. Charles-MGH Station is 0.1 mi away for added convenience. Step into one of the 298 luxurious rooms, where you can take advantage of sofa beds, minibars and 24-hour room service. Don't miss the Egyptian cotton sheets, down comforter and free bottled water. This hotel offers a nightclub, limo/town car service and a fitness center. Dining options include 2 restaurants, and the 4 bars/lounges are great spots to lift your spirits. In addition, you'll find conference space, a business center and concierge services. Take advantage of the free WiFi and wired Internet in public areas. 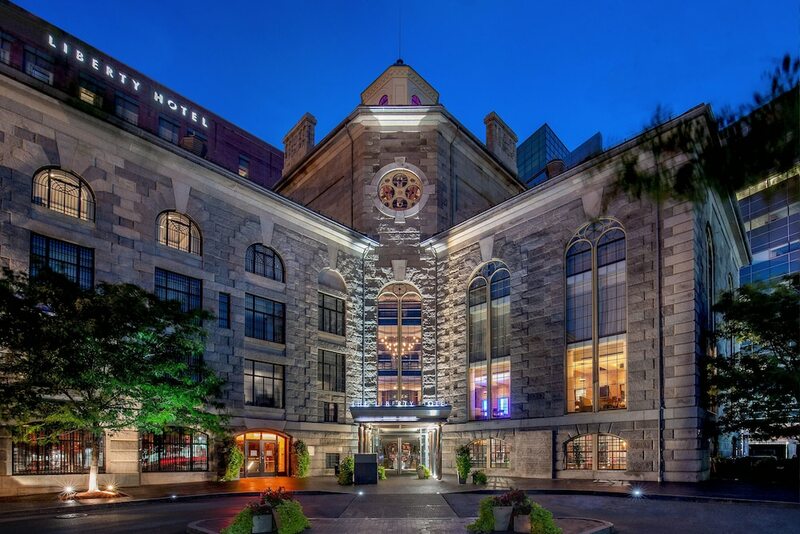 Located at the foot of Beacon Hill, The Liberty, a Marriott Luxury Collection Hotel, Boston comprises a richly restored 1851 building (formerly the Charles Street Jail) and a new 16-story tower. Soaring 90 feet, the lobby was formerly the jail's atrium and features the original three-story arched windows and dramatic catwalks. The jail's former exercise yard is now a beautifully landscaped courtyard. Opened in 2007, The Liberty is one block from both the Charles River Esplanade and Massachusetts General Hospital. A "T" public-transit stop is right outside the hotel. The Massachusetts State House, with its magnificent dome, is a half-mile away. Attractions within 1.5 miles include the Museum of Science, Boston Common, the Public Garden, the aquarium, Faneuil Hall Marketplace, and the Old North Church. Guests of The Liberty are welcomed with a glass of sparkling wine. CLINK., the hotel's acclaimed restaurant, features small plates, wines by the glass, and signature cocktails. Seating is beneath the soaring lobby rotunda or in the dining area by an original jail cell. The Alibi bar is a Boston hotspot, with drinks and light fare served amid vestiges of the jail (including brick cell walls) or out on the private garden patio with sunset views. There are concierge services, tours/ticket assistance, luggage storage, and a safe-deposit box located at the front desk. Dance the night away at the nightclub or enjoy the terrace. Have a business function in one of the 10 meeting rooms. The entire hotel is smoke-free. CLINK. - An open kitchen, butcher block tables, and gold leather seats amid vestiges of original jail cells. Creative menu fusing European culinary tradition with contemporary American innovation. Scampo - Contemporary space serving Italian cuisine with global influences, house-made breads baked in a tandoori oven, pastas, and entrées. Alibi - Located on the entry level and set in the old “drunk tank” of what was the Charles Street Jail. celebrity mug shots on the walls. Cocktails and late-night snacking. Outdoor, off-street patio with sunset views. Open every evening until late. Liberty Bar - Located within the 90-foot lobby rotunda of the hotel. Extensive wine and cocktails list features house-infused liquors and tasty treats like Veal Sliders and addictive Spicy Mixed Nuts. Catwalk - Housed on a catwalk encircling the lobby's rotunda with stunning views. Serving a dinner and bar menu featuring a selection of items including Baked Oysters Casino with Butter, Shallots and Bacon; Mushroom Sliders on Brioche with Cream Cheese and Sherry; and a twist on the classic with Ralph's Potato Chips with Smoked Truffle Salt. The Liberty's fitness center is open 24 hours a day. One block from the hotel, a footbridge leads to the Charles River Esplanade, a paved riverside path ideal for walking and jogging. The recreational activities listed below are available at the hotel or nearby; fees may apply. The property has connecting/adjoining rooms, which are subject to availability and can be requested by contacting the property using the number on the booking confirmation. This property allows pets in specific rooms only (surcharges apply and can be found in the Fees section). Guests can request one of these rooms by contacting the property directly, using the contact information on the booking confirmation.